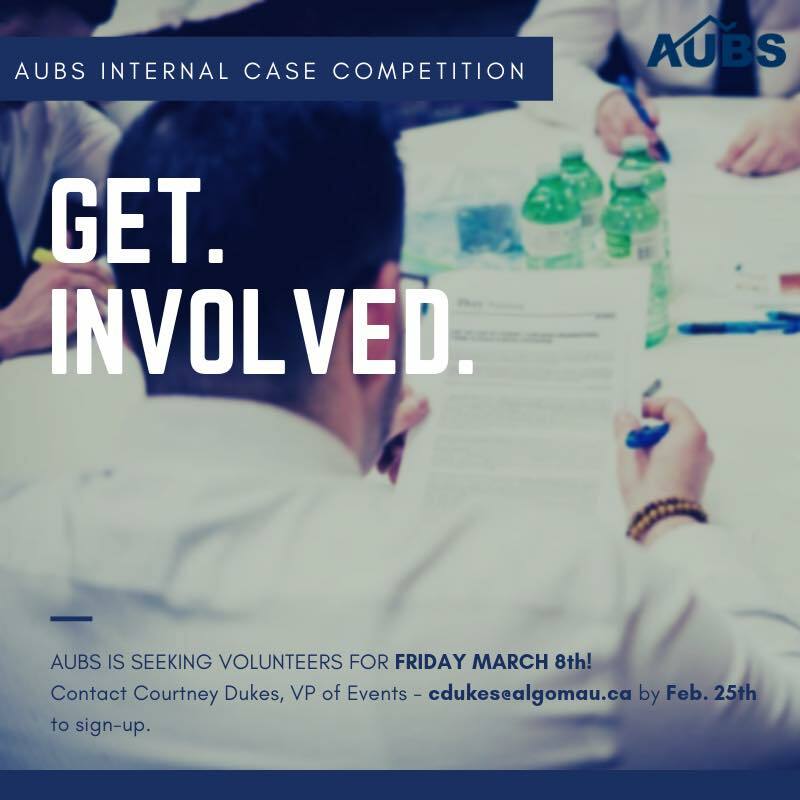 ​There will be an Internal Case Competition hosted by AUBS! Friday, March 8th from 9am to 5pm at Algoma U! Please note we are currently looking for student VOLUNTEERS to help out with the event! This will be a great opportunity to get involved with the school and gain experience with case competitions for the future! cdukes@algomau.ca if you are able to volunteer for a portion of the day. AUBS is hosting an information session regarding opportunities with the BDO followed by a chance to speak with some representatives from Sault Ste Marie office. AUBS is hosting the 4th Annual Career Networking Night! This will involve roughly a 30 to a 45-minute panel discussion followed by a networking hour with students and local business people. Be sure to RSVP to secure your spot and have the opportunity to network and gain knowledge from local professionals. This event requires business professional attire! The textbook sale allows you to sell old textbooks, you pick the price, we do the work, you get the money! You also can purchase textbooks that others have handed down for dirt cheap prices. Check out our Facebook Page for up to date information! 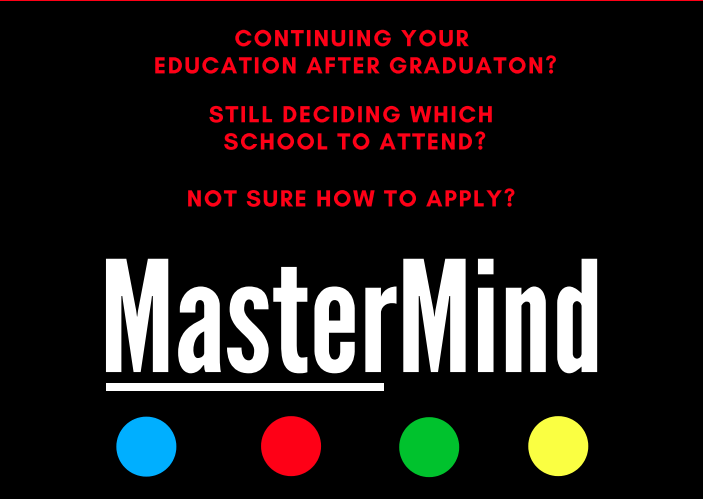 A great opportunity for third and fourth year students to learn about different Masters and Post Grad programs and how to apply and admission requirements. Hear past alumni share personal experiences of their application process! This event is held by the Algoma University Experiential Learning HUB. Come join us to discuss the importance of How to Business! This session will outline the difference between business casual and business formal attire, as well as include information on business etiquette provided by the Sault Community Career Centre. This will prepare you for the Career Conference taking place on Friday, October 26th, as well as prepare you for your future in the business world. **FIRST YEAR STUDENTS SHOULD HEAVILY CONSIDER ATTENDING THIS EVENT. On October 18th, before the evening excitement, YouLaunch is happy to present a youth lunchtime event highlighting some key tools and speakers to help you incorporate technology in your business ideas and plans! First up we have a YouLunch & Learn from 12pm-1pm in EW205 (Doc Brown Lounge) featuring Monique Morrison from Jeronamo Solutions and Success with Digital to present a workshop walking participants through a Social Media and Web Presence scorecard! How well does your personal brand or business score? Following Monique, we welcome Kristy Rachkowski from Vibe Eatery from 1pm - 2:30pm to speak about how she has incorporated technology in her business and ways to measure her digital footprint to create business success! As always this event is free, lunch is provided, and a parking code will be available to exit the parking lot. Please register so we have an idea of numbers for lunch! Bridges to Better Business is an annual event that targets the small business community in Sault Ste. Marie and is hosted by the Sault Ste. Marie Economic Development Corporation through the Millworks - Centre for Entrepreneurship. The Bridges to Better Business event is a spectacular opportunity for entrepreneurs to connect with business leaders and gain first-hand knowledge from renowned experts. Each year during BDC's Small Business Week, this event brings together hundreds of businesses in various stages of development for an open exchange of ideas, advice and feedback lead by dynamic speakers and mentors. There are many learning and networking opportunities for participants. A new component of this event is a Pitch Competition, where 2 local businesses will share their business idea with the audience and have a "Pitch Off". The audience will get to vote for their favourite business idea and the winner will receive a Grand Prize valuing at $15,000! Headshots will be taken/provided to you for no charge. The Algoma University Business Society welcomes post-secondary students, professors, and local professionals to an evening filled with networking, snacks and locally brewed beer! Stop in to say hello, or stay to chat and network with some students and professionals. ​AUBS will be providing finger foods - limited menu available for other food purchase. Need textbooks but don't want to pay the bookstore price? Want to sell textbooks you longer need? We have you covered! 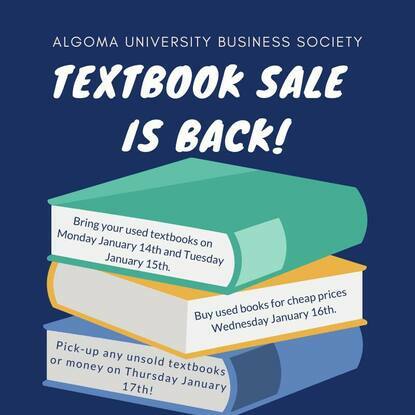 The textbook sale allows you to sell your old textbooks - you pick the price, we do the work, you get the money! You also can purchase textbooks that others have handed down for cheap prices! This event takes place right beside the security desk! Sell old. Make money. Buy used. Save money.